A quick dish in less than 30 minutes and all the ingredients can be found at a local Asian supermarket. You can substitute the shrimps with any other protein you like or take them away for a vegetarian dish. Bring a pot of water to boil, add noodles and remove from heat. Soak until tender (about 10 min) Drain and rinse through cold water. In a small bowl, mix all pad thai sauce ingredients and set aside. In a saucepan, add oil, pan-fry shrimps until pink and opaque. Set aside. Add oil, stir in egg, scrambled. Set aside. Add oil, stir in bean sprouts, cook for 3 minutes. Set aside. Add oil, stir in red pepper, cook through. Set aside. In a large frying pan, add shallots and garlics, cook for 1 min. Add noodles and all cooked ingredients. 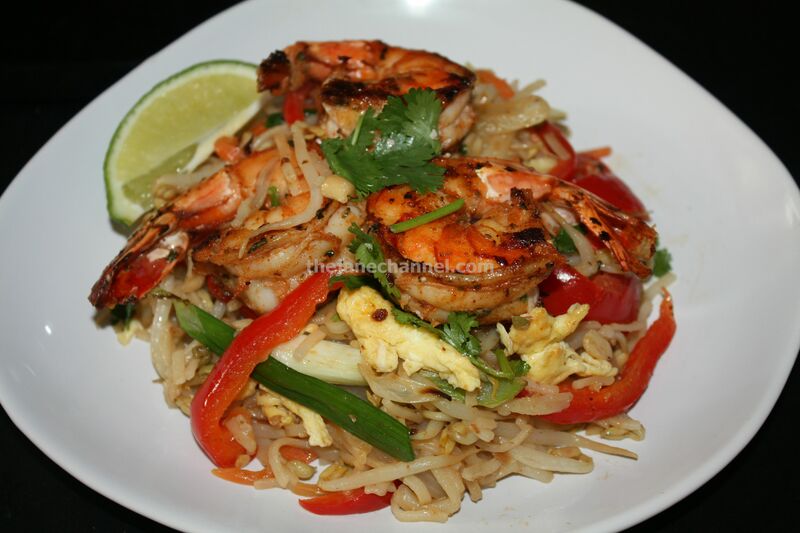 Stir in scallions, Pad Thai Sauce and cilantro. Mix well and remove from heat. Sprinkle roasted peanuts and lime juices.